Reading the biology of happiness by neuroscientist Stefan Klein( The science of happiness). 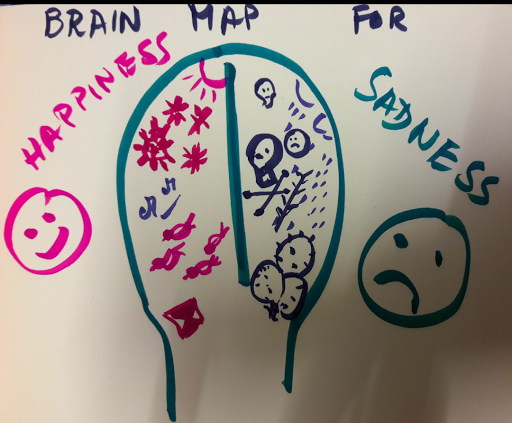 So did this small diagram to explain your brain map of happiness. Am finding interesting tidbits as to you can sort yourself physically. So much of this spoors back to yoga for me and the awe how rishis guessed these connections. If the right brain is dominant people find it difficult to recover from bad experience, even something simple like a bad image in the papers. Even after the subconscious suppresses the reaction it stays below the surface as a bad feeling. In yoga u can sort your L -R brain imbalance and activate the left brain with the surya bheda ( the sun breath). But it needs to be monitored by an expert. We await your post on Surya bheda.